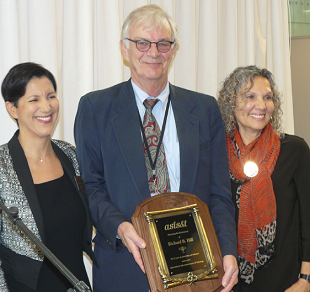 The ASIS&T Award of Merit was given to Peter Ingwersen. Richard Hill was honored for his 27 years of service to ASIS&T by immediate past president Nadia Caidi (left) and current president Lynn Silipigni Connaway (right). Welch (Florida Hospital Endowed Chair in Healthcare Simulation at the University of Central Florida) noted that for at least 500 years, we have been using technology to create human surrogates. For example, in the late 1400s, Leonardo da Vinci was designing and building mechanical animatronic humans. In the mid-20th century, we began using electromechanical technology to represent humans, including audio-animatronic humans such as those pioneered by The Walt Disney Co. and virtual humans created by computer graphics. The Telepresence Valley refers to the revulsion one might feel if the appearance and behavior of a human surrogate are almost, but not quite, realistic. Welch presented mechanisms and current applications that are being used to bridge this valley, particularly in the medical education field. “Text and Data Mining Meets Biomedical Research,” the second plenary speech, was presented by Markus Bundschus (head of scientific and business information services at Roche Diagnostics’ Bavarian Site). He said that given the unprecedented growth of scientific knowledge, the range of text and data mining applications is huge and diverse in pharmaceutical companies, and there are currently few alternatives to these techniques. Describing the decade-long development of a single successful drug, he tallied a cost of 1 billion Swiss francs (about $1 billion), 7 million working hours, 6,587 experiments, 423 scientists, 385 patents filed, 2,400 PubMed articles, and 512 genomic cancer samples released. He compared the use of full texts, abstracts, and curated data during the development and showed equal use during the final phases. In closing, he suggested that there is a controversy surrounding text mining: Is it enabling people to read less or enabling them to read more relevantly? Information science pioneer Paul Otlet and others sought ambitiously to expand bibliographical access through using the newest technology (cards, the Universal Decimal Classification, and, potentially, much more). They eventually adopted “documentation” as the term of choice. Watson Davis and, later, Jesse Shera picked up on European documentation and promoted it, but in limited ways. Davis, the principal founder of ASIS&T (as the American Documentation Institute) in 1937, seems to have been primarily interested in technology, especially microfilm. Shera promoted the book Documentation by Samuel Bradford by republishing it with a new introduction. The U.S. zoologist Herbert H. Field developed a service essentially similar to Otlet’s through the Concilium Bibliographicum, which is based in Switzerland. The poster “Push a Badly Built Cart With Bumpy Wheels Along a Marshy Meadow, or A Short Tale on the Importance of Information Science,” by Peters and AgnesMainka (Heinrich Heine University Düsseldorf), traced the development of information science education in Düsseldorf, Germany. They described the recent movement by students to oppose the closure of the Department of Information Science at Heinrich Heine University Düsseldorf, which is a good example of community mobilization, even if the protest did not prevent the closure—it delayed it until 2019, leaving students with the opportunity to finish their studies. They also noted that in contrast to the Anglo-American and European traditions, it was not possible to study library science at universities in West Germany. To become a librarian, students had to go through additional training (at specialized schools and on the job) after having completed a university degree in any subject. Norbert Henrichs (creator of the text-word method of information retrieval) was in charge of the development of an information science curriculum for the University of Düsseldorf, a minor subject that was first called “applied philosophy” due to its roots in philosophy documentation and because it could be studied only as part of a philosophy degree. In 1989, information science became its own subject, which provided the opportunity for doctorate studies. In 2004, information science became part of the bachelor’s and master’s degree studies of information science and language technology, making it a major subject at the university. During the session An Investigation of Retracted Articles in the Biomedical Literature, presenters John M. Budd (University of Missouri), Zach Coble (New York University Libraries), and Alison Abritis (Retraction Watch) categorized the reasons that articles are retracted. Their study of 1,307 papers from 2010 to 2014 shows reasons such as scientific misconduct (plagiarism, conflicts of interest, duplication, authorship issues, etc.) and errors (data, analysis, samples, methods, etc.). The study also includes an examination of citations of retracted papers from 2001 to 2005 (265 articles were cited 3,946 times). During the preconference session The Contribution of Middle Authors to the Production of Knowledge in the Biomedical Field, Philippe Mongeon (University of Montreal’s School of Library and Information Science) reported the results of a study of 35 years of biomedical research and clinical medicine publications from the Web of Science. He found 230,000 inexact or altered author names in 2.5 million articles with six or more authors. Some had multiple last names (such as Starr Koslow Mautner indexed as Mautner-SK), there was transliteration of foreign names and letters and concatenation of hyphenated last names (such as Smith-Jones becoming SmithJones), and names with a prefix were changed (such as van Leeuwen becoming vanLeeuwen). It is worth noting, he said, that since 1998, Thomson Reuters has improved the indexing of author names, which reduces the number of altered names in the Web of Science. 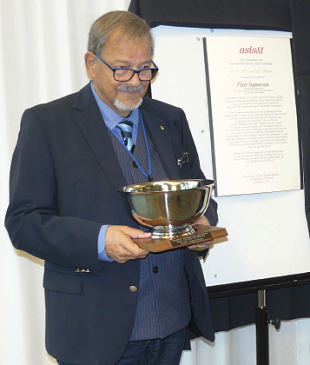 The ASIS&T Award of Merit was presented to Peter Ingwersen (University of Copenhagen’s Royal School of Library and Information Science). It recognizes individuals who have made particularly noteworthy contributions to the field of information science. Ingwersen joined the Royal School faculty in 1973 and became a full professor in information retrieval in 2006. He is one of the most widely published and highly cited researchers in information retrieval, bibliometrics, and webometrics. Diane Sonnenwald (University College Dublin) and Donald Case (University of Kentucky’s College of Communication and Information) were presented with the Watson Davis Award, recognizing continuous dedicated service through active participation in and support of ASIS&T programs, chapters, special interest groups, committees, and publications. Case served as ASIS&T president 2008–2009, and Sonnenwald served 2011–2012. Case’s research impact is evidenced by more than 4,300 Google Scholar citations of his various journal articles, conference papers, book reviews, and monographs. 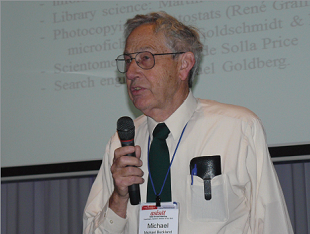 Sonnenwald was instrumental in the name change from the American Society for Information Science and Technology to the Association for Information Science and Technology, the creation of the Asia Pacific Chapter, and planning this first meeting outside of North America. Richard Hill, executive director of ASIS&T, who retired at the end of 2016, was honored for his service of 27 years by the officers and members of the organization. It was noted that during his leadership, ASIS&T moved from a deficit budget to a sizable surplus, the contract with Wiley-Blackwell for publishing the Journal of the Association for Information Science and Technology (JASIST) was favorably renegotiated twice, and JASIST went from six to 12 issues per year. In addition, the ASIS&T Online Digital Library was begun with cooperation from Wiley-Blackwell and goes back to Volume 1, Issue 1 of what is now JASIST. 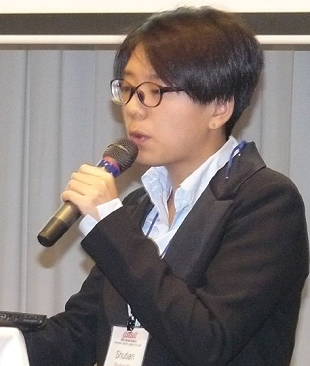 The large attendance and the presentation of papers by attendees living outside of the U.S. and Canada reinforce the decision to globally redirect ASIS&T and acknowledge it as a worldwide primary information science organization. There were 424 attendees from 37 countries (there were 406 attendees from 19 countries in 2015). Reflecting the expansion, 47 participants were from six Asian countries (there were 15 attendees from three Asian countries in 2015). This may be partly credited to the recent establishment of the Asia Pacific Chapter. The 2017 annual meeting will be held in Washington, D.C. Conference proceedings for 2016 are available at asist.org/files/meetings/am16/proceedings/index.html. Emil Levine is an American information science and library consultant living in Vienna. He has been a member of the Association for Information Science and Technology (ASIS&T) for 40 years. Send your comments about this article to itletters@infotoday.com.